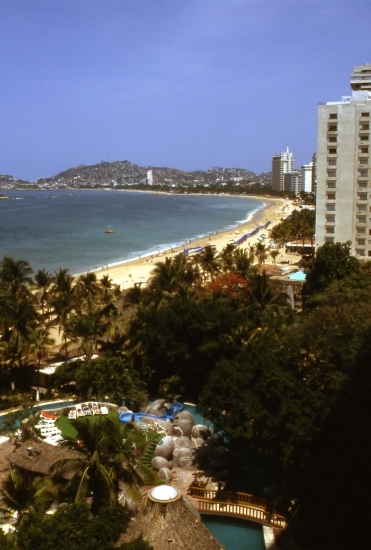 Acapulco was Mexico’s first major resort. Overlooking the Pacific, Acapulco had been fashionable among wealthy Mexicans since the 1920s. The first road from Mexico City to Acapulco opened in 1927; this became a four-lane highway in the 1955 and is now a toll super-highway. The development of Acapulco during the 1940s and 1950s, with new roads, hotels and an airport, provided alternative employment for peasants who had left their land, and helped to reduce the flow of migrants out of the poverty-stricken state of Guerrero. Some viewed Acapulco as a growth pole for further coastal development, but most other coastal towns continued to lag behind for decades. By the 1950s, it had become the playground for Hollywood’s jet set, the world’s first major resort to rely mainly on tourists arriving by air. In the 1960s, Acapulco’s city center was redeveloped and a new airport was built inland. Acapulco began a prolonged period of stagnation during the 1970s, struggling to cope with urban growth, the provision of adequate urban services and air and water pollution. In the past decade, it has turned things around based on a series of major gated hotel developments that overcome visitors’ security concerns. I stayed in Acapulco in the early 70’s. I’m from Canada. I was shocked when I drove a few miles outside of the very beautiful tourist areas, and saw most people living in one room shanties, without refrigeration, a single electric light hanging in the middle, and a mud floor. Thanks for the comment. I also first stayed in Acapulco in the 70s and, as you rightly say, the disparities were very evident. There are still great disparities in Acapulco, as in Mexico’s other coastal resorts, even though much progress has been made. Do you happen to have photos from that time that you would be prepared to have published on Geo-Mexico? If so, please let us know! Thanks for publishing my comment, and responding. I don’t think I have any photos, but I will take a look. If there are any, I will certainly send them to you. When does it rain in Mexico? Does tourism in Acapulco match Butler’s resort cycle model?